A game like Roller Coaster Tycoon comes but once in a decade. At its launch, it was a completely unique experience to anything out there on the market. You built, ran, and played God within a theme park. It seemed like no matter the level of gamer, everyone I knew had it growing up. After a few successful sequels, the franchise began to falter and radically change past its 3rd installment. After a decade of waiting, the team behind Roller Coaster Tycoon 3 has rebranded the series as Planet Coaster for a spiritual successor to reboot the franchise. The game has been in Alpha since March and I recently got my hands on the latest build prior to the games release in November. First, let's talk about what's the same. You'll be glad to hear this is the exact same Roller Coaster Tycoon experience you first fell in love with. You can build roller coasters, pay for pre-existing rides, and take on challenges to make your theme park the best in the land! Right now the Alpha only allows for Sandbox and Challenge mode on two maps but the final version will have a story mode and several maps to make your dream park a reality. 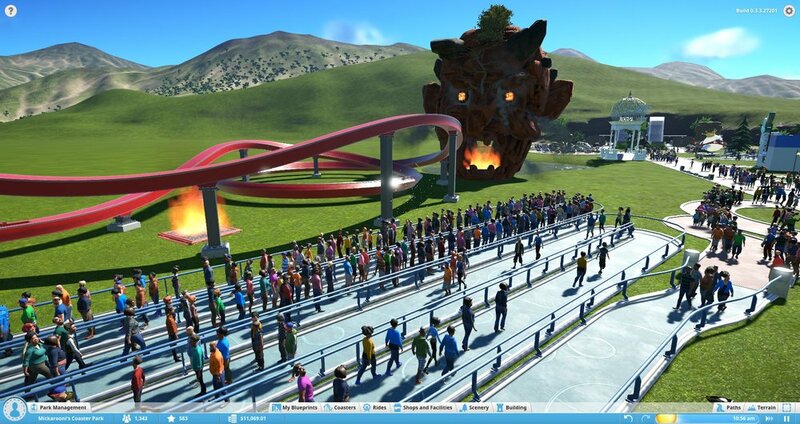 Really the only thing I couldn't do (other than features that are currently locked) was drown the people who visit my park and that's kind of a bummer. Everything that is different about Planet Coaster elevates this series in a way that it could've never had done before now. Steam Workshop will be what keeps you playing this game again and again! Players can download scenery, buildings, rides, and even theme parks from other players in the game. If you want the front of your theme park to look exactly like Disney World, there's already a building you can add to your "blueprints". It's actually kind of insane the amount of customization this game allows. Make no mistake if your park looks generic while playing it will be entirely on you. You now have the ability to widen your walk paths so your patrons aren't marching single file, and paths now curve and aren't forced to snap in a grid formation. As for patrons, you're now able to follow them from a first person perspective, which isn't as interesting as it sounds but it can have it's moments. Graphically this game has been given a huge facelift. Your park will spring to life as you hear crowd chatter amongst bass pounding dubstep, hard rock and the roaring of the rollercoasters. It looks and sounds like a theme park, which I never thought was so important until I experienced it. Overall I'm very pleased with the early access version of the game! It gave me huge waves of nostalgia that reminded me of the long hours I dipped into this game. I can see throwing myself into this game for several more long hours at launch. Pre-Order it right now on Steam and save 10% or nix the 10% for the special edition and get access to the beta of the game early November and some other sweet perks. Planet Coaster launches November 17th.